Thirty two heli sling loads later...and were still not finished! 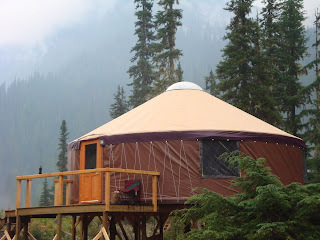 Two nine day sessions with the crew and we have our 27ft Yurt ready for our Beta season. We are busy constructing the sleeping/sauna chalet this fall and getting ready for another deep powder winter. We want to provide El Nina with the best hospitality ever, hopefully she will be our special guest for this upcoming season in the North Blue. We experienced a short delay this summer when a wildfire sparked up at 18.km in early August and cut off our access. Travelling up to the North Blue that day and seeing the smoke our stomachs sank thinking we're already going up in smoke! We soon discovered the awesome response by Clearwaters' Initial Attack fire crew made short work of that fire! Good thing we brushed and improved the road last fall as they accessed the area much quicker. The construction crew enjoyed meals created right here in the work camp kitchen...including salmon phyllos, moose meat balls with huckleberry ketchup and our favourite flambayed single malt bananas. Lee Ann never disappointed us with her magic meals...Our ciders and beer stayed cold in the mountain stream during the blistering hot days and we all looked forward to the cool evenings and mornings. The lower valley in the North Blue has Old Growth cedar trees that rival those in Carmanah....almost. We counted the rings on a an old snag near the chalets' and it appears to be around 500 years old! You can see Brenda hiking the Mountain Caribou trail just west of Mt. Nelson....this is the most amazing trail. We followed it and found ourselves easily hiking up through the forest to TL in no time. We could see that this wildlife trail is a vital link between upper and lower elevation habitats. Both Caribou and goat hair hang in thick bunches on the tree branches and bushes. The second fly in was shrouded in the thickest forest fire smoke we have ever experienced in the North Thompson....they say the smoke stretched all the way out to Saskatchewan. It was unreal and at times we only had a few hundred meters of visibility. Check out our new website and don't miss out on skiing the Cariboos...deep powder skiing, sighting the elusive Mountain Caribou and ripping in the best tree skiing on earth. Come join us and we'll name a run after you! Wow! I am looking forward to getting in some runs and cooking for all you mountain goats! I want a run called Smiley for all the smiles that are sure to come!